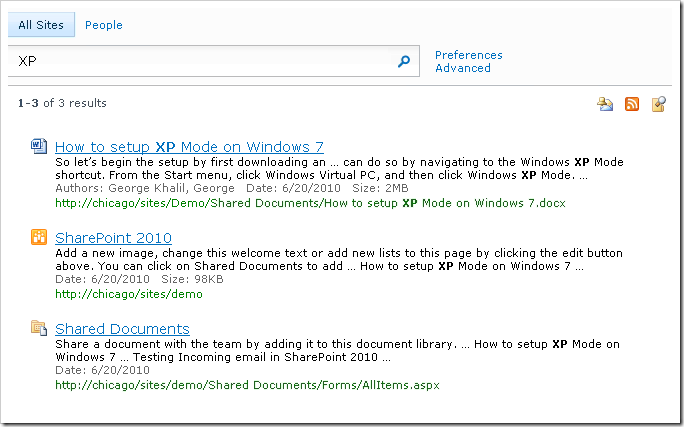 March 2012 – Share SharePoint Points ! Configure PDF files support in Sharepoint. 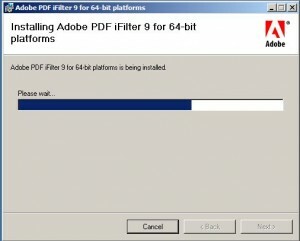 1) Install PDF iFilter 9.0 (64 bit) from PDFiFilter64installer.zip. 3) Navigate to Central Admin | Manage service applications | Search Service Application and once there click on “file types” to add the PDF file type. 9) Upload any sample PDF document(s) to the document library of your site. 10) Perform FULL Crawl to get search result or Perform incremental to include PDF files. 11) Once the crawl is completed we will get search results. 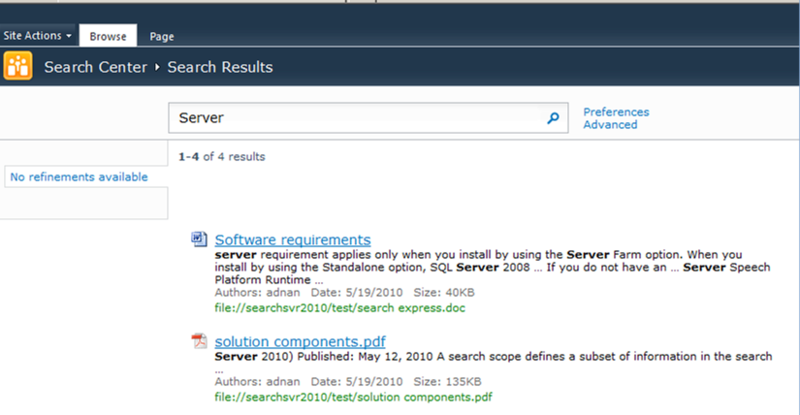 Now your SharePoint will support PDF files in search content. Happy sharepointing :)..
Concept of search scopes was introduced just to allow user to narrow the searches on the basis of the content sources, external sites and metadata properties. Scopes are the integral part of the search UI by providing user to select the desired scope using the drop down. 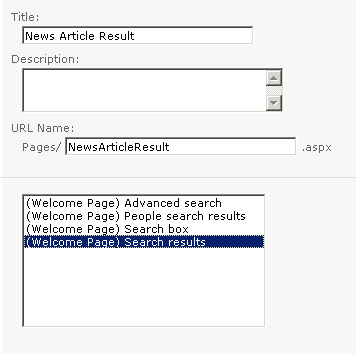 These can also be per-configured search web parts such as search result web part. Scopes works on the logically “And” option on user searches. Suppose if you have defined a scope for a content type then search results will be narrowed down only for specified content type. 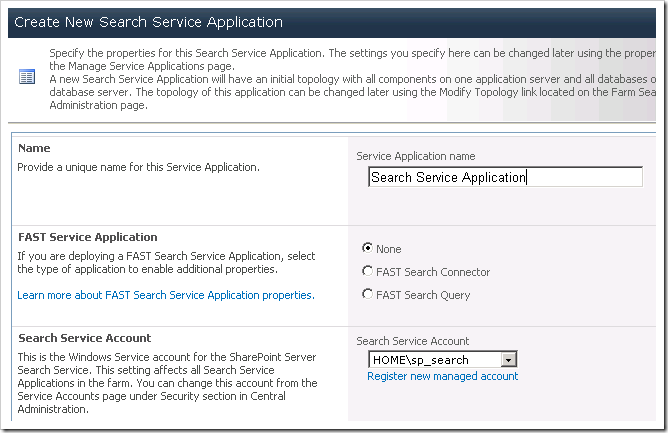 Search scopes set at the service application level are available to all sites and site collections within the service application. These scopes cannot be modified or deleted at the site administration level. 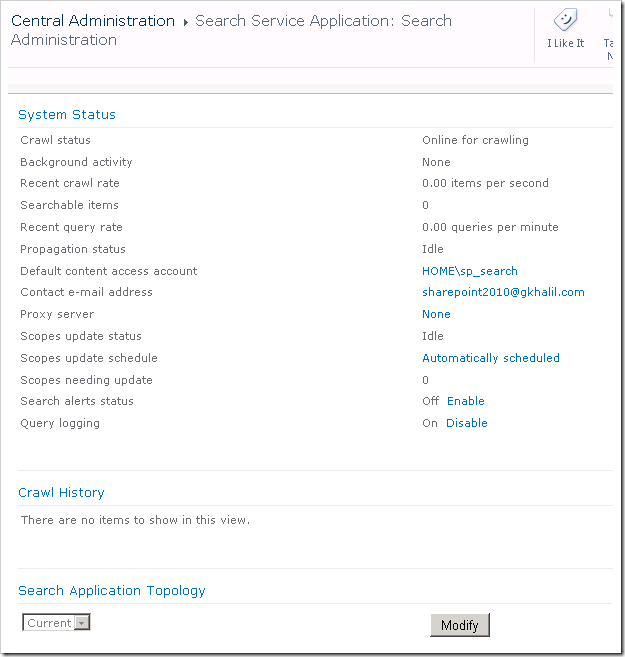 Open up Central Administration, go to Manage Service Applications, click on your Search Service Application and then click on manage on the ribbon. This takes you to the search administration page. Then click on New Scope, A scope is made up of a title that the user sees when choosing it from a Search Web Part. The description describes what the scope represents. This is for administrative purposes. The Target Results page gives you the ability to use the Default Results page or specify a Custom Results page. In my case, I will be creating a new scope for news content type. You are taken back to the scopes page and you can see the new custom scope that we just created. Now we need to add the rules that make the scope work, so click on Add rules. First we want to add all of the content sources that you would like to find tasks on. This allows you to not include tasks on a certain site if you would like, it also it want allows you to get tasks from another farm. You will only be able to configure this for sources that you have indexing configured. So if you are looking to find tasks on another farm you have to setup that connection to have it indexed first. There are four search scope rule types. 1) Web Address Rules – This type of rule can incllude content in web sites, file shares, exchange public folders, or any other content in the search index that has a URL. These can include the following. Folder – Includes items in the folder and subfolders that pertain to the indicated path. With SharePoint URLs you can create rules that include or exclude different elements, such as a site or a particular folder. Host Name – Limits content to a particular server name. Domain or Sub Domain – Limits content to a specific, fully qualified domain name such as contoso.com. 2)Property Query Rules – Limits content where a managed property is equal to a certain value. 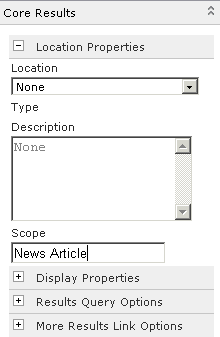 Only managed properties that have the “Allow this property to be used in scopes.” option checked can be used to limit content. Content Source Rules – Enables you to limit content to a particular content source. This is useful if your service application has numerous content sources and you want to limit the scope to just a SharePoint content source or more granular types of content sources such as My Sites or Team Sites. All Content Rules – Includes all content. Enables the construction of a more complicated scope that includes many rules. For example, you can combine this rule with an Exclude Content source rule. By doing so, the scope contains all content except possibly a file share content source. Scope rule behaviors enable administrators to combine multiple rules together using simple logic. This simple logic enables administrators to create precise subsets of content. The recommended limit for the number of rules per scope is 100 or 600 per service application. Include – Any item that matches this rule is included, unless the item is excluded by another rule. Use this option to apply an “OR” rule. Required – Every item in the scope must match this rule. Use this option to apply an “AND” rule. Exclude – Items matching this rule are excluded from the scope. Use this option to apply an “AND NOT” rule. If you don’t see ContentType as an option when creating this rule, go to Search Service Application –> Metadata Properties and then edit the managed property and set All this property to be used in scopes. Then repeat the steps above. Next step is to take a long breath and relax till new scope will be ready for use. Go To Search > Site Actions > All Site Content > Pages. Open the pages library and from the ribbon click on document and then click on New Document > Page. Fill in all the necessary field and click on Create. DON’T FORGET TO CHECK IN YOUR PAGE. In this step we’ll create a search result page. In this step we’ll add a tab in our search linked to the search page. Fill in all the necessary field and click on Save. In this step we’ll add a tab in our search results linked to the search result page. Let’s look in our search. Nice, but it doesn’t work yet. We haven’t linked our scope to our results yet. 5) Adding Search to Search Results. 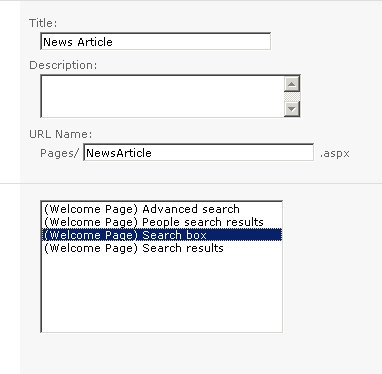 Go to correct search page(NewsArticle.aspx) and edit page. Do and edit webpart on the search box. Change the result page under Miscellaneous and click OK. Adding the scope to the search results. Change the scope under Location and click OK.
You will see that if you do a deeper search starting from the results pages, he will search in ALL Sites instead of Base. Change the resultpage for the search box on the result pages and that will be fixed also. In my few previous post, I described how search service application has been created and configured. But just creating a service application doesn’t solve our purpose. We must have some page or site where user can use this application to perform search. SharePoint has some built in site templates(Enterprise search) to use search application features. In this post I will explain how one can create search site by performing simple steps. As per the project infrastructure, we can either create a separate web application for search but I will create search site collection under the same web application where default SharePoint site is configured. Navigate to Central Administration > Application Management > Site Collections, then click on Create site collections. 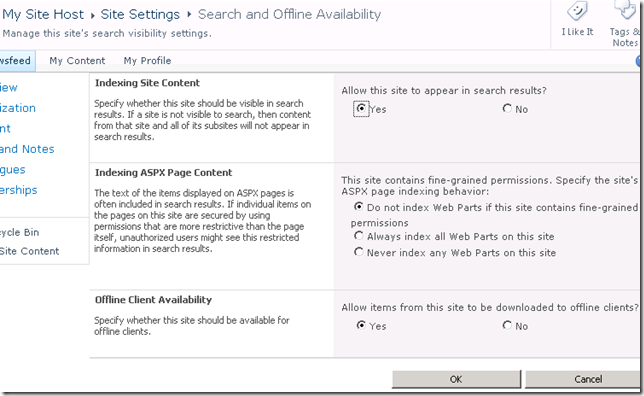 Ensure you are creating the Site Collection below the relevant Web Application. Enter your Title, Description etc and select the Enterprise Tab under Template selection. 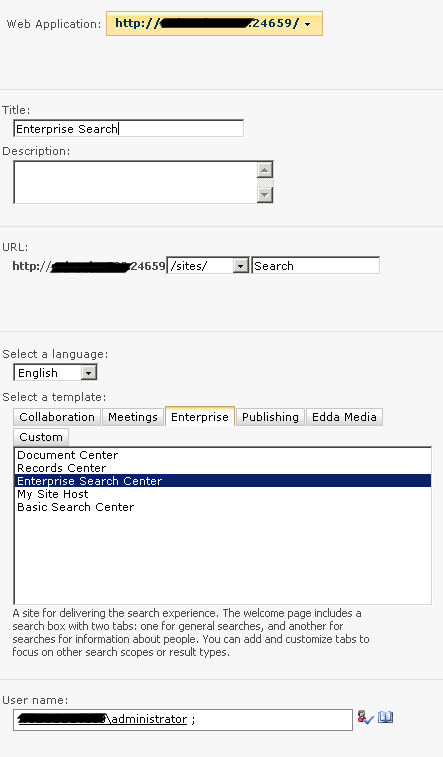 Select the Enterprise Search Center, specify your site collection administrators and click OK. If you have already completed full crawl from the search service application, you can now perform searches just for testing purpose. Also you can perform the people search. In the site collection settings under the “Site Administration” setting, there’s an option called “Search and offline availability” which contains a switch that seems to be disabled by default for certain templates (eg for the “Blank” site template, “Search Centre” or “My Sites”). 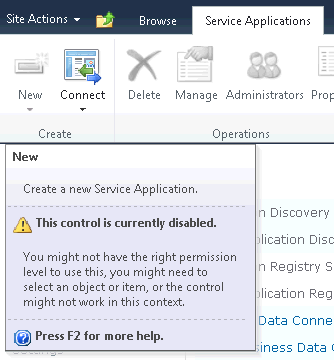 If you are getting messages in the Unified Logging Service on the SharePoint Servers that looks like “This item and all items under it will not be crawled because the owner has set the NoCrawl flag to prevent it from being searchable”, then go into Site Settings –> Site Administration –> “Availability of search and work offline” for the site in question and set the “Indexing Site Content” switch to “Yes”. 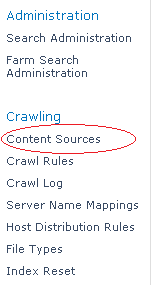 Easy to fix, hard to find – all of the other search controls for a site collection are located under the “Site Collection Administration” setting, but this one – and ONLY this one – is tucked away under “Site Administration”. Issues 2: People search is not working. Resolution: Make sure that your search crawler administrator account must have adequate permissions on User profile service to search for people. Navigate to “Search service application” home page. Under system settings find the value of “Default content access account” which will be search crawl admin account. Now navigate to the “User profile service application” under “Manage Service application” option. Simple click once on the application name so that its shown selected. Now Click on “Administrators” from the top ribbon. In new dialog box, make sure search crawl administrator account has been added, if not simple add it and also make sure that it have rights to “Retrieve People Data for Search Crawlers”. In Central Administration, in the Quick Launch, click General Application Settings. 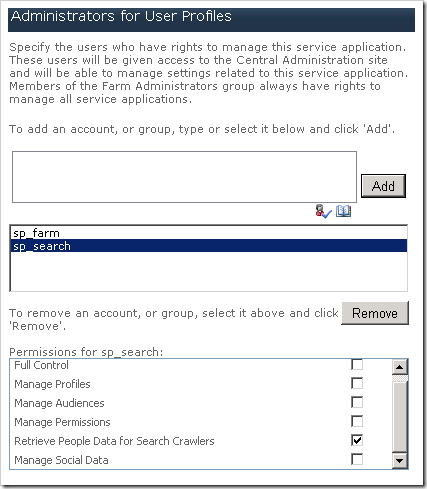 On the General Application Settings page, in the Search section, click Farm Search Administration. On the Farm Search Administration page, in the Farm-Level Search Settings section, click the value of the Time-out (seconds) setting. In the Search Time-out Setting dialog box, in the Connection time (in seconds) box, type the number of seconds that you want the search system to wait when attempting to connect to a content repository. In the Request acknowledgement time (in seconds) box, type the number of seconds that you want the search system to wait for a content repository to respond to a connection attempt. Search results are also restructured to use refinement panel, improved in people search area, enhanced to display and filter only relevant results. In this post, I will start explaining from scratch to create/configure search service application and later on we discuss how we can configure custom scopes in enterprise search site. 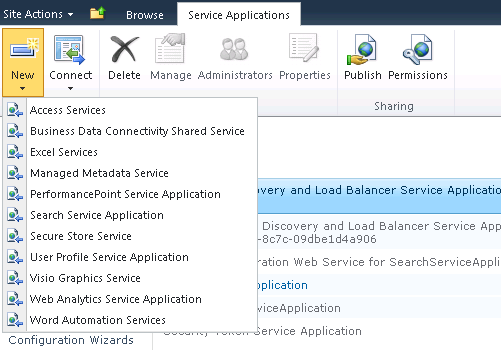 On the Manage Service Applications page, on the ribbon, click New, and then click Search Service Application. If New link is not clickable then you must open the browser with option “Run as administrator”. Name: Enter a name for your Service Application. Search Service Account: Click on Register new managed account and ensure your domain account has already been provisioned in Active Directory. I have created a separate search account; e.g. DOMAIN\sp_search. Select Managed service applications under Application Management. As was the case with SharePoint 2007, our Local SharePoint sites will be detected by default, albeit without a crawl schedule. Check to see that your Start Addresses are located within your content source via editing the content source from the drop down menu. These includes all SharePoint Web Applications and the sps3 “User Profiles” address. 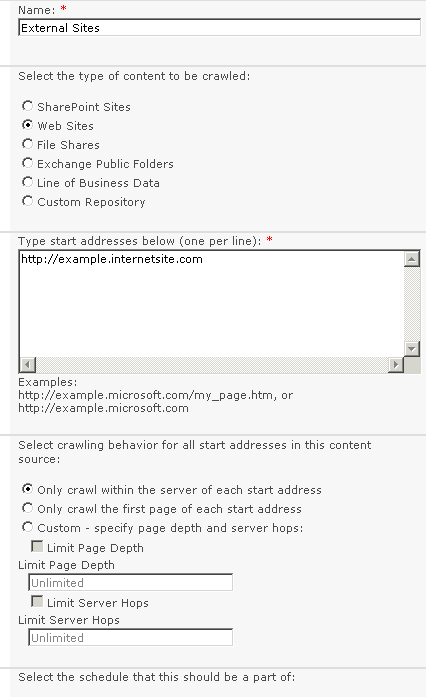 You can easily create your crawl schedule by clicking on Local SharePoint sites and scrolling down to Crawl Schedules. Once your crawl has completed, you should confirm that there were no errors encountered during the initial crawl. Usually any errors noted are most likely due to incorrect permission assignments. For more information, see Add, edit, or delete a content source (SharePoint Server 2010). Also if one needs to configure the external content sources then have a look on the post Configuring external content sources. 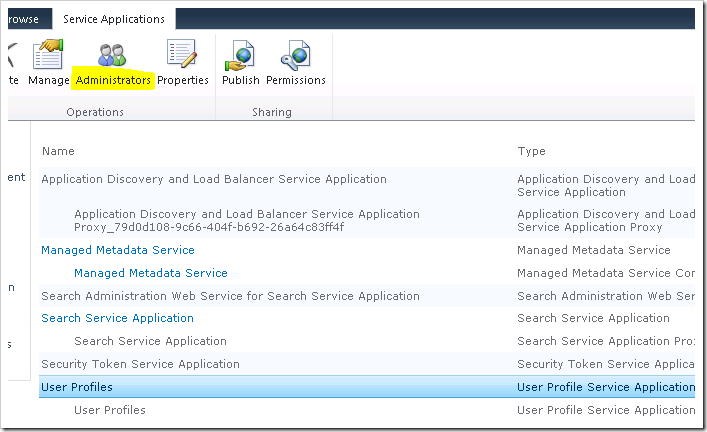 In order to perform the people search, it is required that newly configured search application administrator must have permissions on the user profile service application. Select Managed service applications under Application Management. Click on User Profiles service. Just highlight the User Profiles and select Administrators from the ribbon. Our newly provisioned search account should have “Retrieve People Data for Search Crawlers” selected as a permission. We will also confirm that our sp_search account has the necessary “Read” permissions against the Web Applications being crawled. Navigate to Central Administration > Application Management > Manage Web Applications. Again, highlight the Web Application in question and from the ribbon select User Policy. 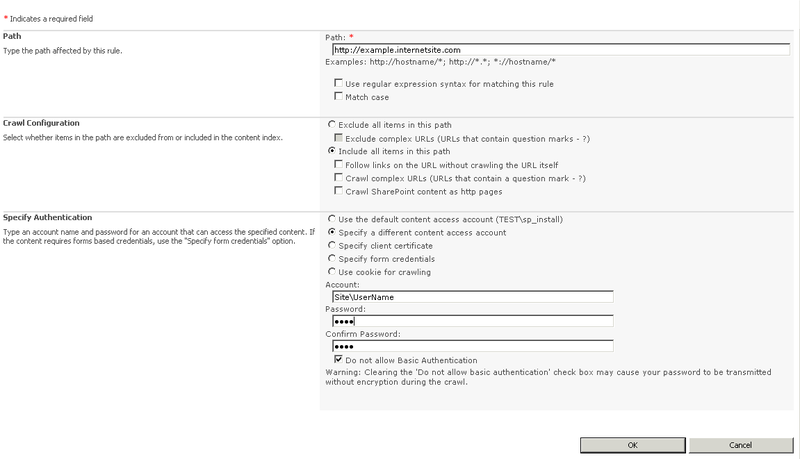 Ensure that the Search Crawling Account is set to the sp_search domain account. With this step, search application is now fully configured. In the next blog I will describe how to create the enterprise search site to consume this application for displaying the results. Also we will see how we can create some custom scopes. Thanks for your time :)..